Veeam, one of the best backup software for Hyper-V, released a new product that support Windows Server 2012 Hyper-V virtual machines. 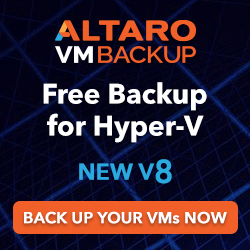 With an easy interface to backup your VMs on the fly, it supports compression, deduplication and the option to restore the VM in any other host. The new version also has a free edition that supports backup compression, VM, VM file and file level recovery, file management and much more.